LAS VEGAS (NYTIMES, REUTERS) - At least 20 people were dead and more than 100 were injured when a gunman went on a shooting spree at a concert on the famous Las Vegas Strip late Sunday, police and US media reports said. Police said the shooter was taken "down" after officers swarmed over the famous boulevard in response to multiple shots being fired from the Mandalay Bay casino resort towards thousands of fans at a country music concert. "We have in excess of 100-plus injured and excess of 20-plus that have died at this point," Las Vegas Metro Police Sheriff Joseph Lombardo told a press conference. The gunman, who was a local man, was killed after police "engaged the suspect," Lombardo told reporters. The suspect was a local Las Vegas man who acted alone, Lombardo said. But authorities were seeking an Asian female who police described as a companion of the suspect, he said. They said that rumours of other shootings in the area were false. Off-duty police were believe to be among the victims. 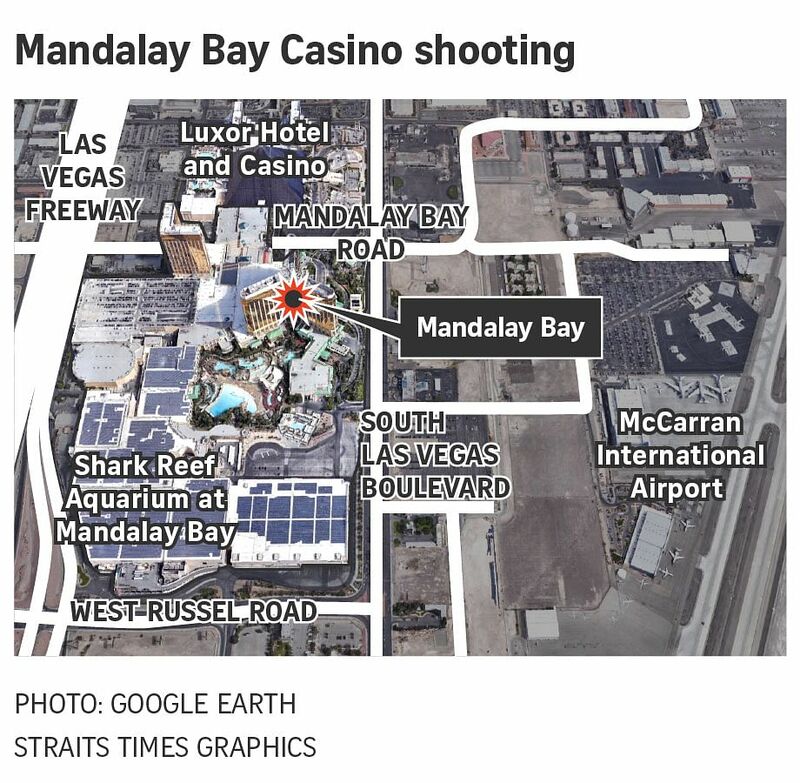 US media, including Fox News, reported that Aldean was performing around 10:45 p.m. local time on Sunday when the rampage began but that he had been bundled safely off stage at the event outside the Mandalay Bay Resort and Casino in the Nevada gambling mecca. CNN reported all the artists were safe. Video posted online showed a musician performing outside the Mandalay Bay at Route 91 Harvest when the sound of automatic gunfire rang out. The music stopped, and concertgoers ducked for cover. "Get down," one shouted. "Stay down," screamed another. The police reported clearing out the Mandalay Bay's 29th floor and working their way up to the 32nd floor. A Twitter post from the Las Vegas Police Department described reports of an "active shooter" near or around the Mandalay Bay casino. The Las Vegas Metropolitan Police Department said on Twitter: "Confirming that one suspect is down. This is an active investigation. Again, please do not head down to the Strip at this time." The police later tweeted that they did not believe other shooters were involved in the incident. "At this time we do not believe there are any more shooters," the police department said. ​It was not immediately clear whether the suspect was killed or injured. Officers were due to give more information shortly. One officer reported that civilians were "trying to take patrol cars" but it was unclear why. The Daily Express reported that there was a bomb threat after the shooting attack, with the Luxor Hotel on lockdown. Multiple flights were diverted away from Los Angeles' McCarran Airport due to the shooting. The spokeswoman for the University Medical Centre hospital said 14 of the wounded were in a critical condition. All had suffered gunshot wounds, she said. One Twitter user posted that the Mandalay Bay Casino hotel was on lockdown, while another, citing police scanners, posted there were two shooters on the 32nd floor of the hotel who had shot at a bodyguard and police. Authorities could not be reached to confirm those details. Hospital sources said that 14 of the wounded were in critical condition. Witnesses heard numerous gunshots at the casino hotel, where police tactical teams were searching for the attacker, according to reports on CNN and in the New York Times. Another Twitter user, @mmmullen, wrote: "Active shooter outside my window Mandalay Bay, Las Vegas. Firing at outdoor concert. Long bursts of fully auto weapons."